Closed for Hunting season and soft conditions. Check web sitecircuitsfrontieres.com for trail closure information. An epic, all-mountain journey that starts from the main trailhead behind the churches and loops all of the areas best trails. This ride starts at the main trailhead behind the church. 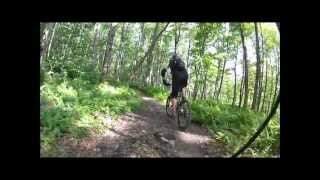 This loop starts with some scenic doubletrack and then hits the nice, flowy and fast beginner trails. The middle part of this loop uses the expert trails, so expect rocks, drops, some very nice view points, and more rocks! The final part of the loop uses narrower technical singletrack and the grand finale features the best trail of the network: The Bobine (21). 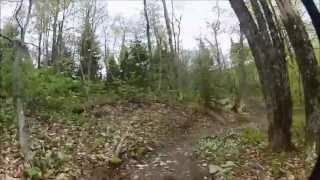 A crazy fast and flowy descent with many switchback turns. Start with a gradual climb on the doubletrack trail - Terminus (29) starting from the main street (rue principale). Take Les Pins from the top of the Terminus (29) trail and the bottom of the Bobine (21). This trails descends on a doubletrack to reach the Chemin des Ctes. Use this trail to climb up to the houle parking lot using the Chemin des Ctes instead of the harder and steeper Bobine (21). From Chemin des Ctes take Monte Pittoresque. This easy climb starts on a open trail and then traverses a old christmas tree plantation before reaching the Bobine (21) trail. Bobine (21) is the signature trail of Circuits Frontires and features an incredible, flowy descent. Eventually, you'll meet up with Aiguille (27), which starts from the Houle parking lot and makes for a great beginner loop with the Ficelle (28) trail. After taking Aiguille (27), turn onto Hritage (30), a flowy intermediate trail with many long wooden bridges. From Hritage (30), take Tilly's Turnpike, which eventually leads to JDA (22). Usually the way up to reach the start of the expert Chasse Galerie (23) trail. JDA (22), is a steady and steep trail up to the junction. Chasse Galerie (23) is located at the mid-point up Mount Hereford. It's rocky and technical, but a very flowy downhill, and home of the famous Sidewalk (trottoir) drop. This stuff is prime East Coast technical but flowy all-mountain goodness. After the white knuckle descent of Chasse Galerie (23), the 50 Pesos Trail is a nice, effortless break. A 1 km pump track... need we say more? From 50 Pesos (26), take Sam and Tilly's Turnpike to Chainon Manquant (25). Chainon Manquant literally means Missing Link. It's the connector trail that links the trails on the Mount Hereford mountain to the trails below. It's a screaming fast trail with a very short up that you can fly over if you're going fast enough. Starting from the intersection of the Chainon Manquant (25) & Troll (19), Indian Stream (16) is either a quick, but steep and technical climb or a fast descent. On the small round summit you have a very nice view of the surrounding mountain in the spring or autumn. Take a right on Panache (18), aptly named after beautifully intact panache (antlers) found while building this trail. Either way you ride this trail you'll have a nice downhill with bermed turns and a taxing little climb. From Panache (18), take Corvette to Ficelle (28). The Ficelle (28) is the second half of the beginner loop that starts with the Aiguille (27) climb. It's a fast , flowy and easy descent through a fir forest. Eventually you'll intersect with Bobine (21), again. It's the signature trail of Circuits Frontires, enjoy it! Finally, descend Terminus (29) back to your car.